This is not the first time I try to paint figs. 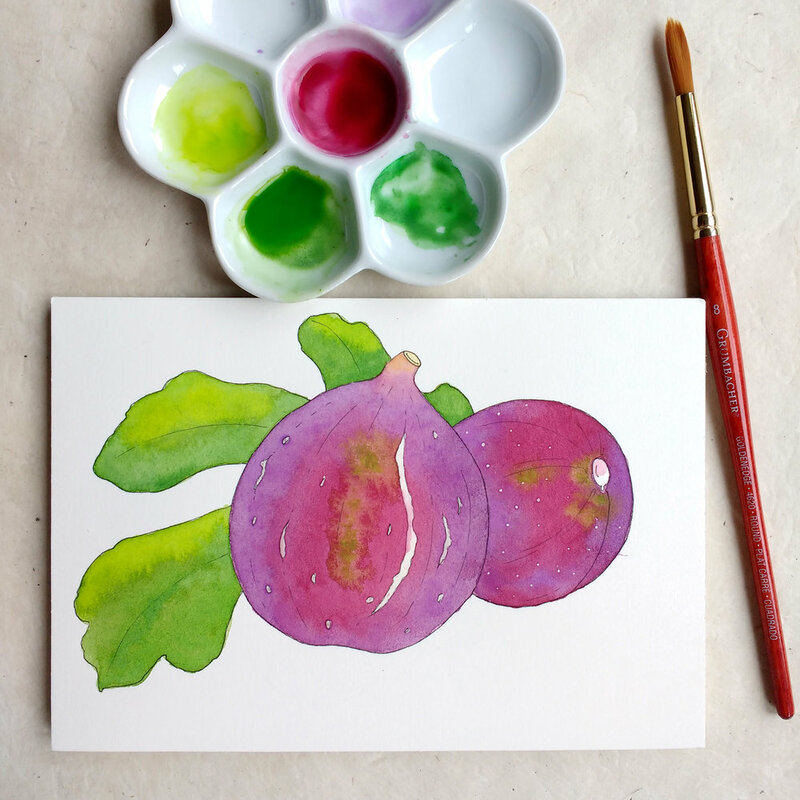 I find it difficult to paint dark, opaque foods or plants, especially when they're purple. Because of this, I tend to avoid purple subjects, and then of course I get less practice, so I don't really improve. 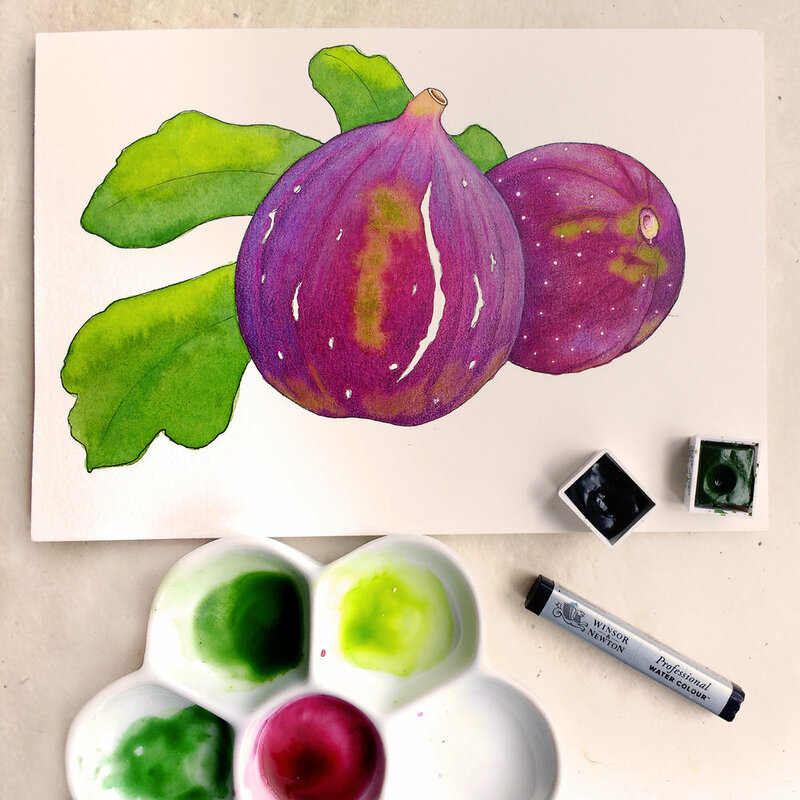 But here it is: I tried again, and while my figs are certainly not quite the right hue of purple, this is much better than my last attempt! I'll use this illustration to describe some of my favorite art supplies (please note I am not sponsored by any supplier). I took a few pictures of the different stages (below). I started with simple line art, including the little imperfections on the surface of the skin. The eraser I'm using these days is a Koh-i-Noor Hardtmuth kneaded eraser (the blue one in the first picture). I like it because it erases very well without damaging the paper. My pencil is a Koh-i-Noor Hardtmuth Progresso woodless graphite pencil. This is the only kind of pencil I use now. Then I applied a first light wash of purple and green Winsor & Newton Professional Watercolors. You can see my new flower-shaped porcelain palette, which I love! Then I built up to richer colors, adding different greens and purples. I always let the watercolor dry completely between each layer. 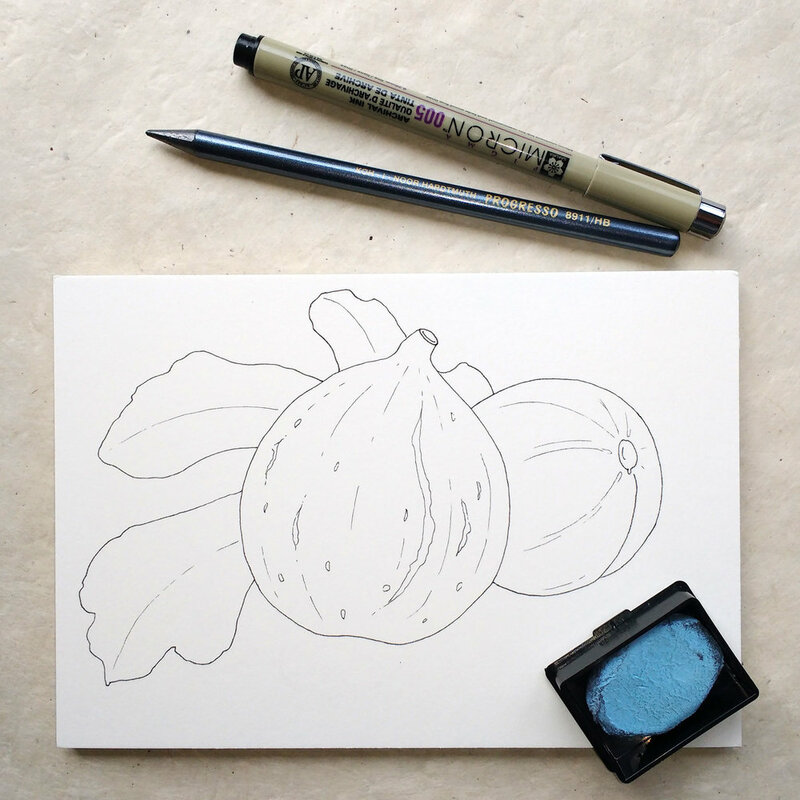 The paper I used here is my favorite, the Fabriano Artistico Acquarello hot pressed watercolour paper block. I like it because it's smooth enough to draw ink lines, but absorbs the watercolor very evenly. Because I still had to add the blue-grey velvety texture to the fig skin, I decided to use colored pencils (Prismacolor). This allowed me to add a lighter colored layer over the watercolor. I used several shades of grey and blue to achieve this. I also blended the greens on the leaves. And here's the finished illustration! © 2010 – 2019 | Cecile Vidican. All rights reserved.